A BuzzFeed article about Dylon, the clothes dye brand, has been banned by the ads watchdog for not being clearly identifiable as an advertorial. The article, "14 laundry fails we’ve all experienced," promoted Dylon’s Colour Catcher product by displaying the brand’s logo alongside "Dylon Brand Publisher". But, after seeing the article on 9 October 2015, the ASA said the ad breached CAP code (Edition 12) rules 2.1 and 2.4. At the bottom of the advertorial it stated: "It’s at times like these we are thankful that Dylon Colour Catcher is there to save us from ourselves. You lose, little red sock!" The webpage also featured a live Facebook feed on the top right hand side of the page, accompanied with links to advertorial content "Top posts from Dylon". In its ruling, published today, the ASA said: "Marketers and publishers must make clear that advertorials are marketing communications; for example, by heading them 'advertisement feature'." After consideration, the ASA concluded that Henkel, Dylon’s parent company, did not convey the commercial nature of their content to consumers. 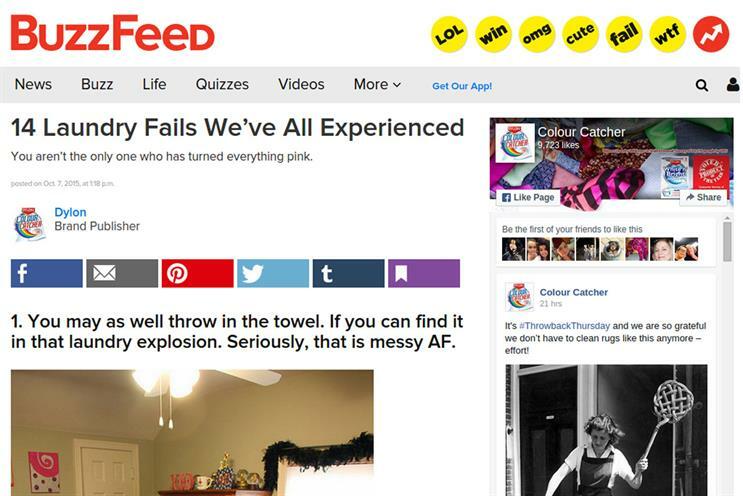 BuzzFeed responded on behalf of Henkel Ltd and themselves stating: "As the ASA had not previously ruled on whether a label such as the one in the ad would be sufficient to alert consumers to the fact that it was a marketing communication, they relied on their US practices to guide how they labelled ads." The online publisher was told by the ASA the ad could not appear in its current form and to ensure ads were obviously identifiable as marketing communications as well as including labels other than "Brand Publisher" for its advertorials. A spokesman for BuzzFeed said: "We're currently reaching out to the ASA to speak with them about this recent update. We're always testing and iterating our ad products and will be reviewing the guidelines accordingly."